It is a picturesque and authentic village, not disfigured by urbanization, which has retained its traditional rural activities. Located at 1450 meters altitude, it offers its exceptional climate (300 days of sunshine a year), calm and good air of the mountain. 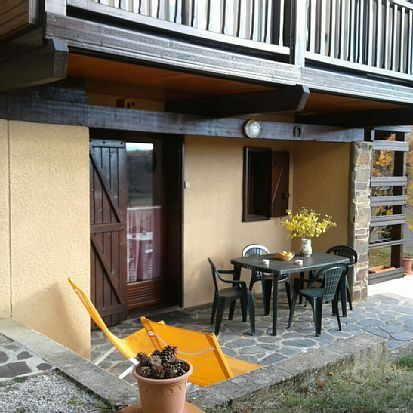 - a wooded and fenced plot of 650 m2 surrounds the chalet. The decoration of the apartment is based on paneling, white plastered walls, exposed beams. Electric heating. Weekly rental (from Saturday to Saturday in principle). Rate varies according to the periods (high or low season). Tourist tax included in the price. The apartment is delivered to the tenant perfectly clean. It is the tenant's responsibility to return it in the same condition. No cleaning fee is charged. In the event that the tenant leaves the apartment uncleaned, a lump sum of € 25 will be taken from the amount surrendered as security.